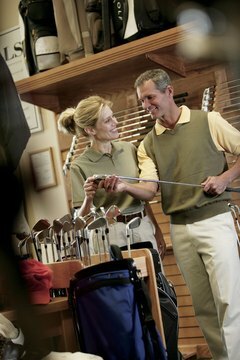 Golf club manufacturers recognize the physical differences between the sexes and engineer equipment which accounts for those differences. In the past, women's drivers were simply shortened versions of men's. Today, club manufacturers have a better understanding of the physical differences between the sexes and how they affect a golf swing. The success of the Ladies Professional Golf Association (LPGA) has also led to improved club design, as the pros have demanded the best possible equipment from their sponsors. The shafts on women's drivers are generally 2 to 3 inches shorter than that of a men's driver. However, this can make it difficult for tall women to find suitable drivers. For taller women, it is often better to choose the longer men's club. Even though it is slightly heavier and stiffer, it won't require you to bend over in your stance to reach a women's driver. Most of a driver's power is generated as shafts flex and rebound. Increasing the shaft flex is one way manufacturers can make a women's club more powerful without adding extra weight. Graphite is often used for women's clubs instead of more rigid materials like aluminum, steel or titanium. Women's swings are usually slower and subject the club to less force, so lighter materials can be used for the shaft without increasing the risk of breakage. Females have smaller hands than males, so the shaft on a women's driver is narrower than the shaft of a men's club of the same length. Women's grips are also shorter than comparable men's grips. If a the club head is too heavy, the golfer cannot swing fast enough to generate the desired amount of power. Women's drivers generally have smaller and lighter heads than men's drivers to offset some of the difference in strength between the sexes. Men's drivers generally have lofts between 9 and 11 degrees on the club face. Because women typically don't hit the ball as hard as men, the trajectory of the shot must be higher to prevent the ball from hitting the ground before it has reached its maximum distance. The loft of a women's driver is usually 12 or 13 degrees. Adjusting the driver's center of gravity is another way golf club manufacturers can make it easier for female golfers to hit long, powerful tee shots. Even though the club head itself is smaller than the head of a men's driver, it is often shaped differently to increase the size of the sweet spot. This has the effect of lowering the head's center of gravity and increasing the loft on the shot.